O Canada! 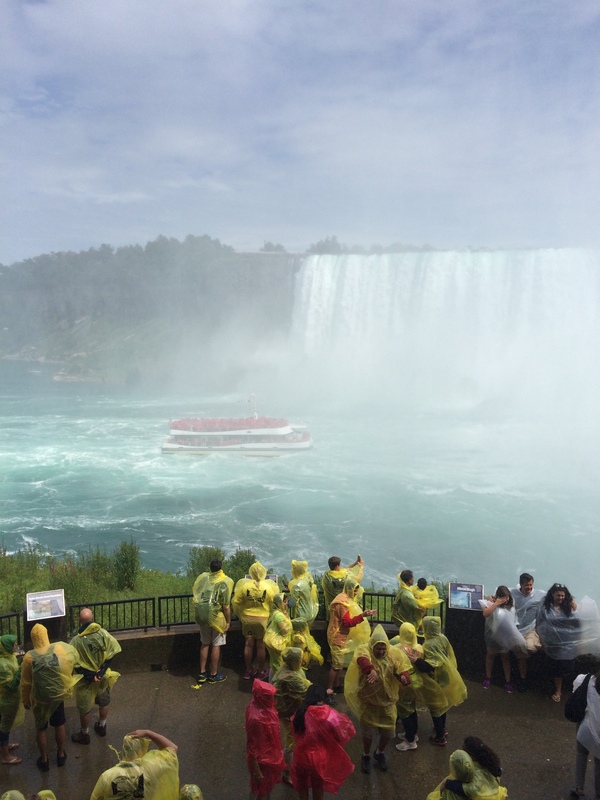 Niagara Falls is beautiful, the people are lovely, and … wow, what a ride. If you want to know how used to your own comfort you are, take a trip out of the country – even if the people there speak your language. There’s never a dull moment. I knew I was in trouble when I called the credit card company to alert them that we’d be out of the United States… and got the automated service. “Where will you be going?” the automated female voice asked. “What part of the area will you be going to?” the voice asked. “What part of the area will you be going to?” the voice asked again, possibly more impatient than before. “Canada,” I replied, slightly irritated, assuming a bad connection. “What part of the area will you be going to?” the voice asked a third time. “Toronto,” I blurted out, picking the one subsection of Canada I could think of. “Yes! Thank goodness,” I said. And the trip had begun. Our first encounter with Canada was a stop at historical Fort Erie. The best way I understand what happened there? The Americans took over a fort that the British had set up poorly. [It took them three times to figure out that the ice expanded off Lake Erie in the winter, exploding the walls of any building situated too close to the water.] Then the British and First Native People came to expel the Americans but the FNP was late and the plan was botched. A second attempt saw the British overrun the fort, defeating the Americans… until a munitions dump exploded. Six hundred British soldiers died; three Americans were killed. The remaining Americans expelled the British. Who won? My Canadian tour guide said… she didn’t know. Upon arriving at the hotel, I discover that we’re situated on the forty-second floor. That’s 42 out of 42 for those keeping score. 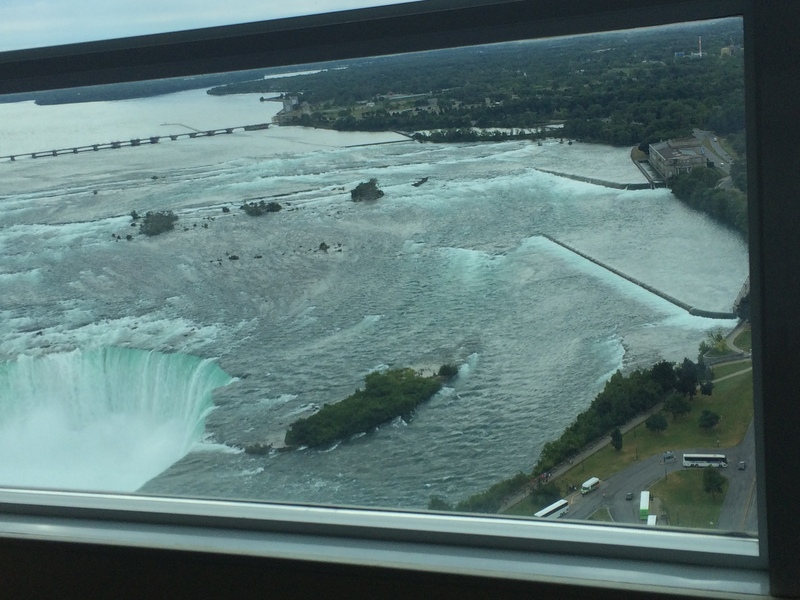 Have I mentioned that I’m afraid of heights and I could see into the falls from my bed? Five days later, I was no less scared of heights but I had successfully made it into my bed every night without falling down. So there’s that. It did give me forty-two floors to consider how well I face anxiety and how much I value other people who are anxious about other things. I’m sure I could post some sort of statistic here about the visitors to Niagara Falls. I can tell you that our hotel was a melting pot of languages, cultures, attitudes, religions, and more. The truth is that humility is universal, and so is stupidity. Rather than tell you that all of the Americans, Muslims, French Canadians, young people, whatever, were [fill in the blank], I’ll tell you that it was one more reminder that while we’re all created in God’s image, we all get to choose whether we show off God’s glory or not. One day at the breakfast buffet, a server at another table was trying too hard to clear a guest’s tray. The guest said she didn’t want the plate moved, and the server waved her hand, “But there’s no food on there!” Sometimes, it seems like we can get so caught up in our ‘jobs’ or checklist, that we fail to see the purpose of why we’re here in the first place. The server’s job was to make the guests comfortable by clearing the table. Clearing the table wasn’t the main thing, making the guests comfortable was. Sometimes, I found myself full of wonder at the Falls. They’re beautiful, and powerful, and surreal. It seems like those who want to see the Earth as ‘young’ are missing something, and those who don’t believe that any of this happened according to a divine plan are… missing something. Maybe there’s some truth in the middle that we should consider if we want to embrace our spirit and our mind. A woman was trying to get up the steps from the buffet to her table. I could take the stairs, carrying a tray, two steps at a time. This woman had to lay her tray down, advance up a stair, pick it up, and repeat the process. She was fully reliant on her cane. I don’t always get it right but in the words of my eight-year-old, I ‘helped an old lady across the street.’ I couldn’t just watch, could I? I’m honestly not sure she needed my help, but I realized that there were so many things that I take for granted … and so many people struggle with every day. Kind of puts it in perspective. I didn’t work at all while we were in Niagara Falls. I didn’t write. I didn’t email. I didn’t prepare a sermon. And the world didn’t come crashing down. [Sure, it helped that the WiFi and phones didn’t work right, but still…] Maybe being a workaholic isn’t the way God intended us to be. On the last day, my family met up with the Norton family. Steve is one of my dearest friends, and until that Tuesday, I had never met him. Of course, we have talked every week for three years, about running churches, faith in movies, raising families, being good husbands, and following Jesus. But thanks to our trip to Canada, I met Steve – and realized how awesome it was to be friends with him. It made me wonder, what would our world look like if we saw everyone as potentially someone we’re supposed to grow to be in relationship with? What if we realized that “kingdom living” means we’ve got to prepare for heaven by actually living like we’re fit for it? Seems like there will be people of all sorts there – even ones we don’t like. This entry was posted in Uncategorized and tagged American, Fort Eerie, Niagara Falls, Ontario, tourist. Bookmark the permalink. You may not have been “working”, but you sure were taking it all in, and I’m sure it will come out in your “work” later on. We leave for Alaska in two weeks, sure I’ll have some observations on people from that trip—-already do, based on the FB group that has formed. Safe to say it won’t only be the salmon out of water — sorry, couldn’t resist.